I went to Oakland Chinatown to run an errand for my dad, and grabbed a milk tea to quench my thirst. I also needed to be caffeinated for my flight to Portland in a few hours! I had never gotten Taiwanese style milk tea at Chinatown before, so I Yelped and Foursquared and this place popped up. Almost everyone raved about the Hokkaido milk tea, so I decided to try it! Hokkaido milk tea is black tea blended with caramel syrup. It also came with boba (pearls/tapioca balls) and egg pudding. At i-Tea, you can opt for mango pudding instead of the standard egg pudding. 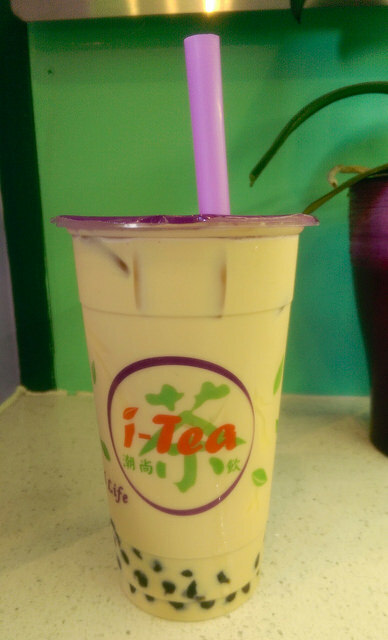 If sweet drinks are your thing, definitely try this milk tea! It’s very sweet and rich.